As the Easter Holiday approaches, it is always a good time to review possible hazards that may be around for your pet. Please remember that pets are very curious & like to explore any new items you are bringing into the home. 1. Easter Lilies – These plants are very toxic to cats. Ingestion of the plant (flower, pollen or leaves) can lead to acute kidney failure. We would highly recommend not having these plants in homes that contain cats, however if this is not possible, they should be placed in an area that the cat does not have access to (access to the plant or falling leaves). If you are concerned your cat may have ingested some of these plants, please contact your veterinarian or emergency clinic immediately. 2. Chocolate – Some of the ingredients in chocolate are toxic to dogs and cats. The degree of toxicity depends on the amount digested, size of the pet and type of chocolate ingested (dark, semi-sweet etc.). Please keep in mind that pets are very curious of new things in the home, so chocolate should be kept in areas that your pet does not have access to. Just because it is in packaging, doesn’t mean your pet won’t eat it! If your pet happens to ingest some chocolate please contact your veterinary clinic for further instructions. 3. 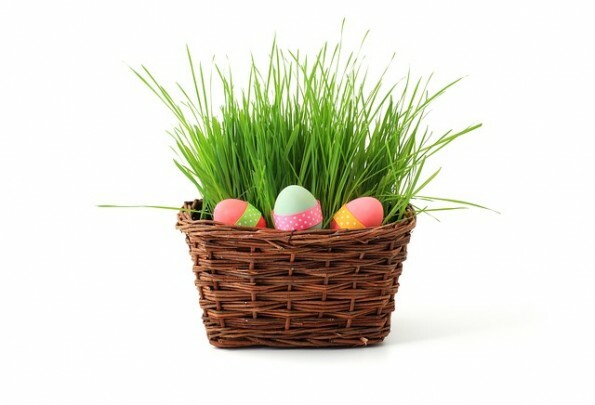 Easter Grass – Easter grass is the fake grass that can often be found in Easter baskets. This type of material coud be a concern if your pet were to ingest any. This “string” like material could become wrapped around the tongue, or become a foreign body in the gastrointestinal tract causing damage to the intestine, leading to an abdominal surgery to remove it. As mentioned above, pets are often curious to new objects in the household, so please keep this in an area your pet does not have access to. 4. Xylitol – This is an artificial sweetener that is using in many candies, as well as baking products and gums. Xylitol is quite toxic to dogs. Xylitol causes a rapid release of insulin in dogs, which leads to a rapid drop in blood sugars. This can be extremely dangerous, or even life threatening. If there is concern about xylitol ingestion please contact a veterinary clinic immediately. 5. Table Foods – If you are having company over, please take care to put pets away during meal times, or inform your guests about not feeding table scraps. While many thing can be toxic to pets (garlic, onions, grapes etc. ), even the food that are not toxic can lead to problems, such as pancreatitis in some pets. Bones should also be kept away from your pets, especially chicken or turkey bones, as they become very fragile once cooked and split easily, which can lead to punctures in the gastrointestinal tract or irritation. We want everyone to have a safe & Happy Easter, so please take the appropriate precautions. Happy Easter! From all the veterinarians & staff at the Thickson Road Pet Hospital! For more information on toxins in pets, please visit the ASPCA or Pet Poison Helpline.